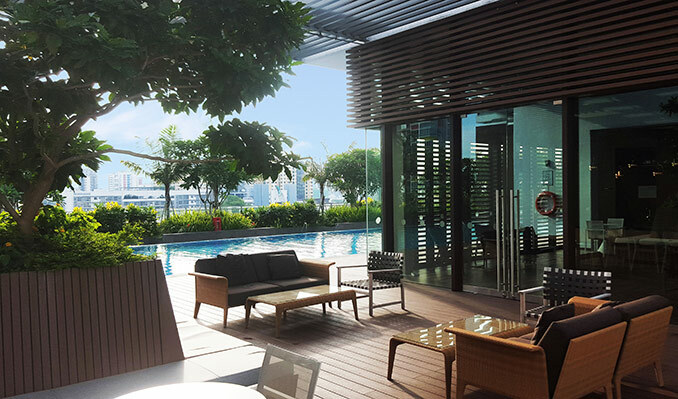 One KM is a mixed-use development, in the vibrant heart of eastern Singapore, Geylang. The lower levels fronting the streets feature a mixed retail shopping mall with a large welcoming atrium spaces, serviced by accessible basement parking for mall users and residents. 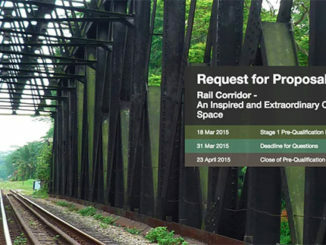 The development is characterised by open airiness and colourful activity. Numerous nodal spaces and green frontages incorporated into the building facade form terraces and balconies above an extensive series of streetscape connections. 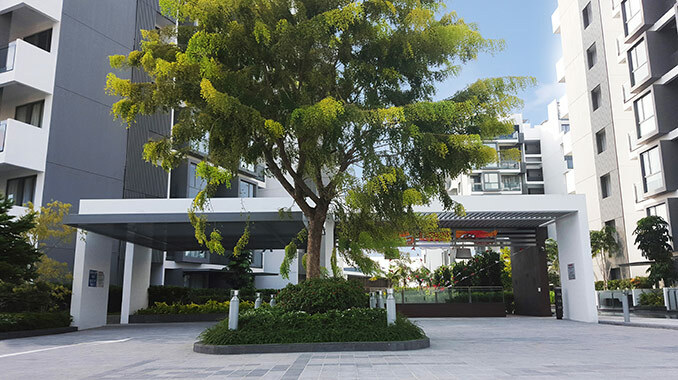 The retail street level is welcoming, softened by the preserved Raintrees and Yellow Flame trees along Geylang and Tanjong Katong Roads. 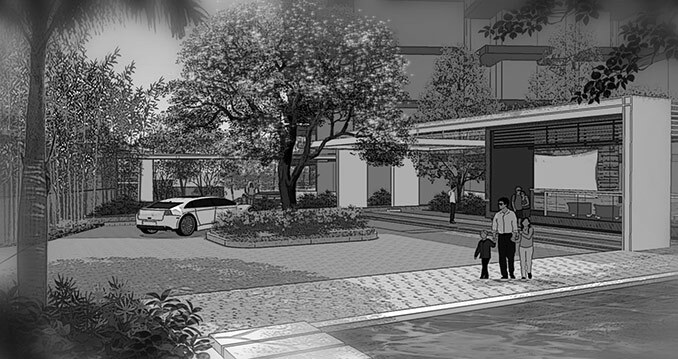 The generous depth of shrub planting encloses and guides pedestrians along the active retail and plaza frontages. Above, on the podium level the intimate outlook across the district is stunning. 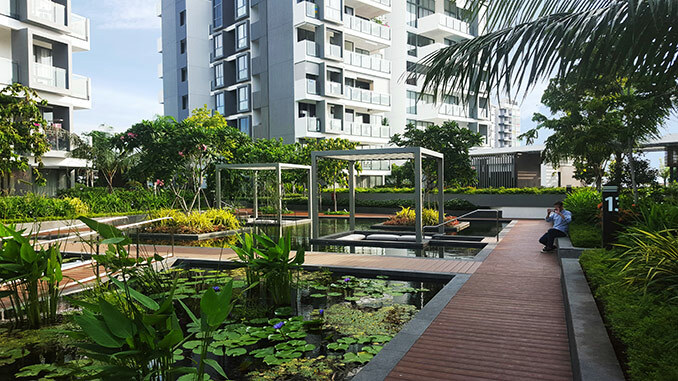 Giving residents and their guests a unique and immediate sense of the active and vibrant Geylang district. 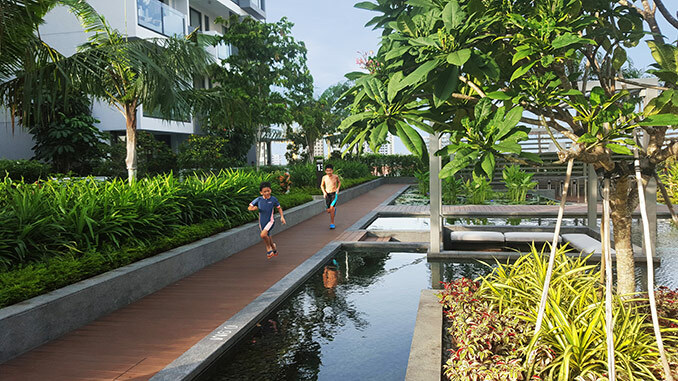 This level is the private domain, a true sky-garden that is a retreat, a playground and a community gathering place for the residents of Katong Regency. Arrival by car or on foot is directly up to the seventh level arrival space, leading seamlessly into a complete garden environment, of mature Dalbergia trees and trailing yellow Tristelatia plants along the arrival court and stepped lawn. 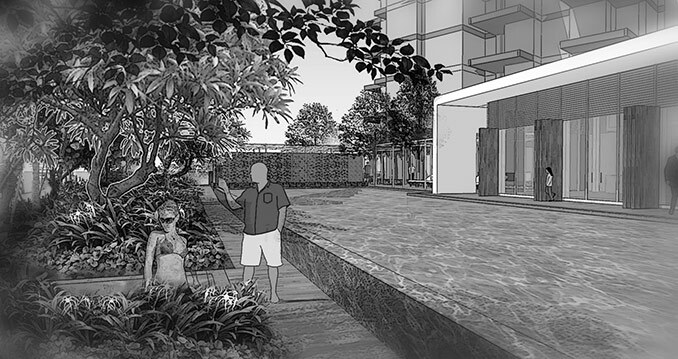 From this airy and breezy level three distinct gardens serve residents; the intimate private garden courts around the lower units, the central water-garden and the club pool alfresco terrace. 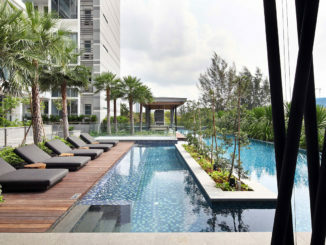 The clubhouse and pool provide a series of interior, covered, and open spaces, with pools for swimmers, families and couples, arranged across two levels, looking out to the horizon. 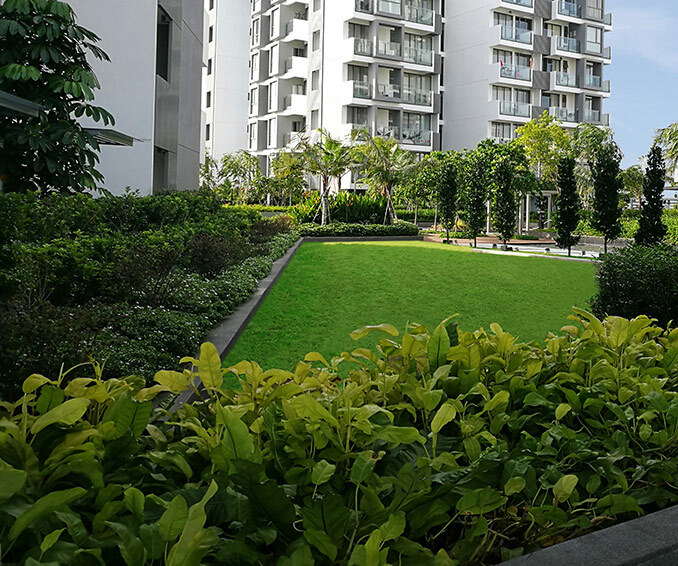 The contemporary condominium style apartments rise from three corners of the podium defining and sheltering the garden expanse, but allowing extensive views and wonderful cooling cross breezes. 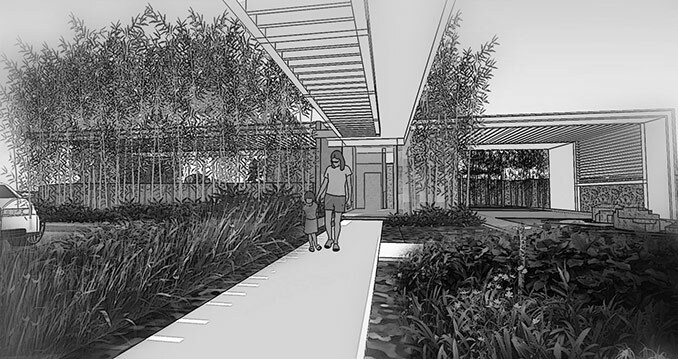 Long axial pathways herald arrival, easy circulation and invite long garden views out over the district beyond. The softscape planting subtly enhances the three garden zones, from stately Garcinia trees marching down the main axial path, to the soft enclosing shrubs around the private unit terraces, with colour and fragrance offering a reflective and very private retreat, to the classical red water lilies, water cannas and delicate patterned Ludwigia spp of the aquatic gardens. 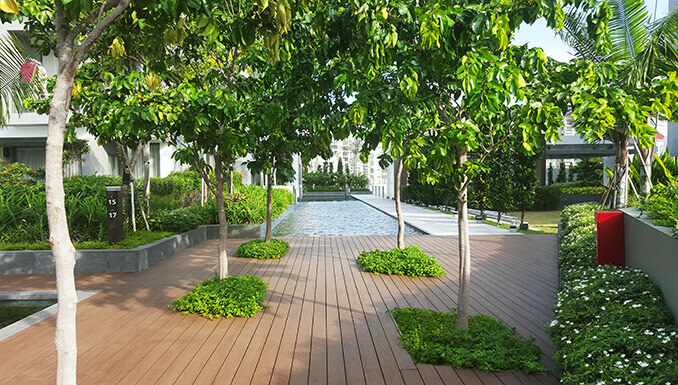 Katong Regency podium garden is a delightful contemporary landscape space. 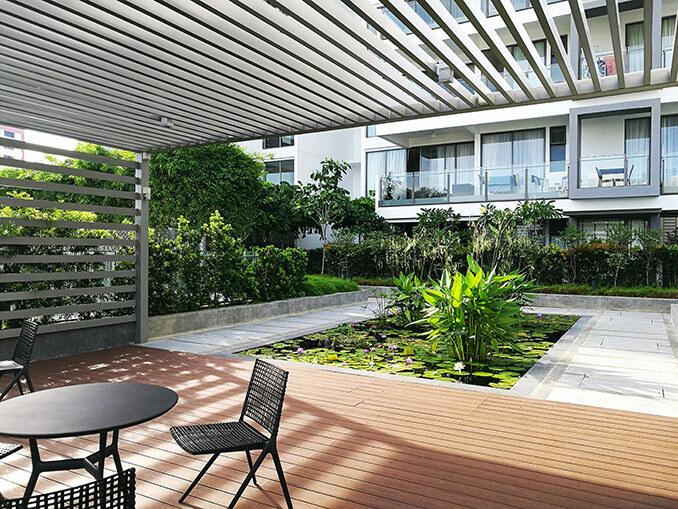 This elevated roof garden is interlaced with extensive water features, shaded places for gathering, recreational facilities for residents and enclosed landscape amenities for all manner of social events. 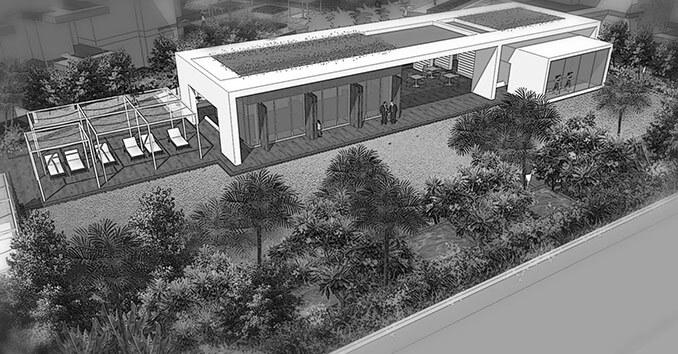 The landscape design is arranged using a language of minimalist geometry, complementing the modern domestic architecture. It juxtaposes hard surfaces with softening naturalistic planting combinations and creates more formal hedging to provide the gardens with a personal scale and intimacy.